President Obama barely appears in “Obama’s War,’’ the new Frontline report on Afghanistan that airs tonight. We only hear his voice, from a speech he made in March, saying the men and women of the military “deserve a straightforward answer’’ to the question of why they continue to fight and die there. That’s even more true today, as the Obama administration ponders a request to send as many as 40,000 more troops to the region. In this thorough and sobering report, Frontline asks pointed questions about the military’s counterinsurgency policy in Afghanistan, outlining just how ambitious its goal - to change the longstanding culture of a nation, turning a downtrodden people against the Taliban - and how daunting the challenge will be for the Americans on the front lines. 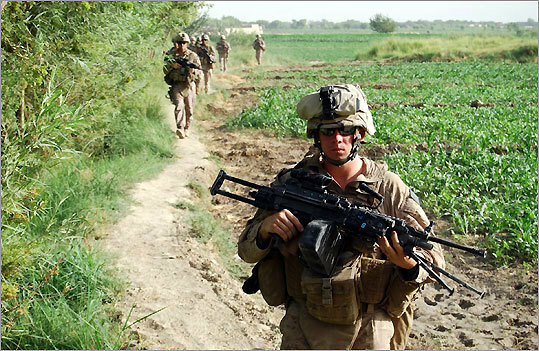 The bulk of the film, and its primary strength, is reporter Martin Smith’s lengthy visit with Echo Company, a group of Marines that has set up a camp in an old schoolhouse in the southern Afghanistan province of Helmand. In this dusty terrain filled with poppy plants that feed the global heroin trade, the Marines are dutifully following orders, trying to win over the locals and earn their trust. They’ve chosen their location, beside a marketplace, in an effort to make the people feel safe as they go about their daily lives. But the locals, threatened by the Taliban, now shop at markets much farther away. Unseen Taliban fighters fire on the Marines every day. Translating the local dialect proves difficult. And convincing the people that they’re safe requires more than reassurance, more even than a show of vast resources. In due time, Frontline takes us from Afghanistan to Washington - where architects of the counterinsurgery purvey their big ideas on overhead projectors - and from Helmand to Kabul, where we learn of pervasive corruption in the Afghan government. We visit with Pakistani officials who swear they aren’t helping the Taliban, and experts who say otherwise. But the most compelling scenes are back on the ground in Afghanistan, where the chasm between policy and reality feels ever more vast. Hearing, in theory, about the challenges of nation building (or “nation rebuilding,’’ as Ambassador Richard Holbrooke puts it in an interview) is one thing. Seeing it in practice is another. And Frontline repeats the disturbing fact that this war seems open-ended. More importantly, it gives us admiration - and a great degree of sympathy - for the Marines under fire, charged with carrying out a lofty theory. They deserve a straightforward answer, and they deserve our attention, too. Joanna Weiss can be reached at weiss@globe.com. For more on TV, go to www.viewerdiscretion .net.